What's Your Grubbiest Tech Confession? Nobody's perfect. Some people Skype without a headset in public. Others insists on using Internet Explorer. 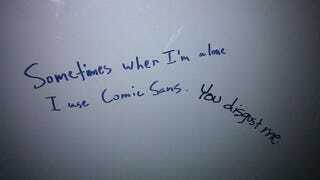 Some weirdos even use Comic Sans without flinching. But what's your grubbiest tech confession? We're all friends here, so let it out. It'll be cathartic. I promise. Is Skyping Without a Headset in Public Obnoxious?